RP Films - "The War"
RP Films has really outdone themselves this time. 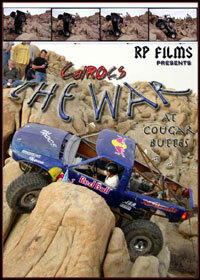 This DVD is packed with great action from Cougar Buttes in the California Mojave Desert. The DVD starts out with some incredible photography by Ryan Baker. The DVD has a fully interactive menu that you would expect from a high dollar production! The in-your-face action makes this video one of my favorites. The soundtrack is well layed out, not too much, but enough to keep the video upbeat. I have always enjoyed RP Films productions, and am glad they have finally stepped into the DVD realm. Watch Tracy Jordan, Jon Bunderant in "Tiny", Don Robbins, Dustin Webster, Kevin Hawkins, and other top dogs punish their rigs in one of the toughest events to date. Plently of rollovers and metal twisting carnage, too. If you don't have a DVD player, fear not - they still offer VHS format for those of you still living in the stone ages. Full Screen/Color NTSC/69 Min. run time.